Homer’s Iliad, the classic tale of love and revenge, is shrewdly retold for teens in Troy High. Narrated by Cassie, a shy outsider who fears that an epic high school rivalry is about to go up in flames, the story follows the Trojans and Spartans as they declare war on the football field. After the beautiful Elena–who used to be the captain of the Spartan cheerleaders–transfers to Troy High and falls madly in love with Cassie’s brother Perry, the Spartans vow that the annual homecoming game will never be forgotten. The Trojans and Spartans pull wicked pranks on each other as homecoming approaches. And the Spartans’ wildcard football star, Ackley, promises to take down the Trojans’ offensive line. But the stakes are raised when Cassie is forced to choose between the boy she loves (a Spartan) and loyalty to her family and school. Troy High will seduce readers with its incendiary cast of mythic proportions. Find Troy High at an independent bookstore near you! Or buy online from: Amazon.com, Barnes & Noble, or iBooks. Or purchase the digital audiobook version from Audible.com or through iTunes! Troy High was inspired by the story of the Trojan War and Helen of Troy. The events of Troy High mostly parallel the events of The Iliad, although some events not detailed in The Iliad have been added to flesh out the story in my book: Helen and Paris falling love, the arrival of Helen in Troy, and the downfall of Troy. I hope that readers familiar with The Iliad will be able to pick out the similarities in the storylines, but you don’t have to be an expert in Greek mythology to enjoy the modern day take on the story. This is so far the hardest and most enjoyable book I’ve written. A LOT of research went into this book, not only on the Trojan War itself, but also on individual characters in the story and American high school football and high school rivalries. But yet I had a lot of fun learning more about mythology and thinking of the pranks that the schools play on each other. 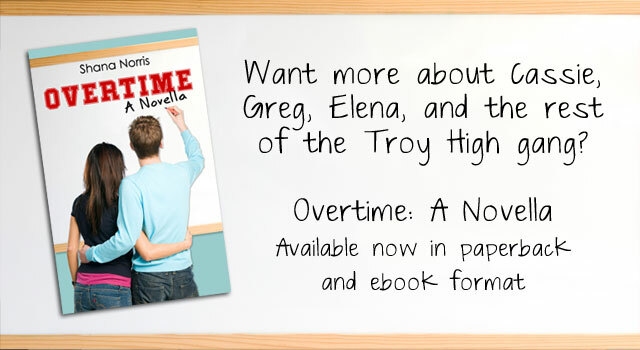 I did take a few liberties with the story in my retelling in order to fit the modern day high school setting, which you can read about in the Author’s Note included at the end of Troy High. Keep in mind that the story is intended to be a bit ridiculous and exaggerated. Troy High takes place in a fictional Southern U.S. small town where rivalries run deep, high school football rules their lives, and it really is life or death to the people who live and breathe it. If you grew up in a small Southern town like this, you know exactly what I’m writing about. I wanted to write a story exploring the different relationships in our lives and how each of them impacts the decisions we make. Cassie has to choose between her loyalties to her brothers and her loyalties to her best friend. I decided to tell the story from Cassie’s (Cassandra the Seer) point of view instead of Elena’s (Helen of Troy) because Cassie was close enough to the action to be a part of everything, yet removed enough to see the disaster that’s looming ahead when Elena arrives at Troy. Cassie is also connected to her Trojan War counterpart in that as the younger sister of these two popular football stars, she’s pushed aside and ignored and her concerns are brushed off. Cassandra the Seer was cursed in that she had the gift of sight, but her warnings would never be believed. It’s obvious where Troy High got its name, but Lacede High’s name was also inspired by Ancient Greece: Sparta was referred to by the ancient Greeks as Lacedaemon. According to Greek mythology, Lacedaemon was a son of Zeus and married Sparta. He named his country after himself and the capital after his wife. Lacedaemon is now the name of a province in the Greek prefecture Laconia, where the ancient site of Sparta lies. From Lacedaemon, I created the school name of Lacede High School, home of the Spartans. Which Troy High character are you? Take the quiz to find out! Below is a list of the songs I listened to while working on Troy High. They helped me get into the feel of the story and remind me of the characters or scenes. This soundtrack is a bit “heavier” than Something to Blog About‘s. STBA had an overall happy, poppy feel. Troy High is more angsty and doesn’t have as light a tone as STBA. I am not affiliated in any way with these artists or their record labels, I just enjoy their music! Trojan War in Literature – About.com’s guide to the Trojan War told through literature. You can find a guide to every book of The Iliad, which includes summaries, character guides, and notes on each book. Trojan War – From Helen of Troy to Homer and Schliemann – More articles from About.com, these detailing deaths in The Iliad, Trojan women, and Helen of Troy. History of the Trojan War – Gives a brief account of the major events of the Trojan War. Timeless Myths: The Trojan War – Gives a very nice overview of the Trojan War and details about everyone involved. Also includes details on Troy’s final days after The Iliad ends, including the death of Achilles, the fall of Troy, and what happens to the major characters in the story after the war. Be sure to read the page on Agamemnon for details on what became of Agamemnon and Cassandra after the fall of Troy. Helen of Troy – A more indepth look at the face that launched a thousand ships. Cassandra the Seer – More details about the cursed princess of Troy. For an ancient time period retelling of the Trojan War, I highly recommend reading Troy by Adèle Geras.